Heat oven to 350°F. In food processor bowl with metal blade, combine bread crumbs, almonds and 1/3 cup sugar; pulse until almonds are finely ground. Add butter; pulse until well mixed. Press crumb mixture in bottom and 2 inches up sides of ungreased 9-inch springform pan. Bake at 350°F. for 10 to 15 minutes or until crust is light golden brown around edges. Remove crust from oven; place on wire rack. Cool 10 minutes. Wrap outside of pan, bottom and sides, with heavy-duty foil. Reduce oven temperature to 325°F. Beat cream cheese in large bowl on medium speed until fluffy. Add 1 1/4 cups sugar; beat until very soft and creamy. Add lemon peel and lemon juice; mix well. Beat in ricotta cheese. Add eggs one at a time, beating just until combined and scraping down sides of bowl after each addition. Pour into crust-lined pan. Bake at 325°F. for 1 hour 10 minutes to 1 hour 20 minutes or until sides of cheesecake are set and puffed but center still moves slightly when pan is tapped. Cool cheesecake in pan on wire rack for 1 hour. Cover; refrigerate at least 3 hours or overnight before serving. Just before serving, whip cream in medium bowl until soft peaks form. Spoon 16 mounds of whipped cream evenly around edge of cheesecake. Top each with candied lemon slice. To serve, remove sides of pan. Cut cheesecake into wedges. Ricotta cheese gives this cheesecake more substance and texture than traditional cream-cheese-only cakes. Its slightly grainy texture is typical of Italian cheesecakes. Ricotta means recooked in Italian; this fresh cheese is prepared form the reheated whey left when milk is heated for another cheese. Mild and sweet, ricotta has a lighter texture than cram cheese, but a richer quality. 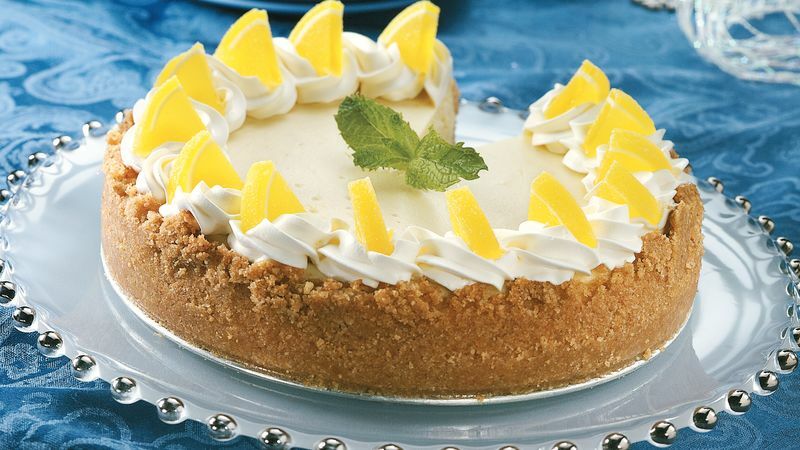 Lure lemon lovers by serving this cheesecake with a dollop of purchased lemon curd or a drizzle of Limoncello liqueur.